This guide will answer many of your questions about using & selecting pressure calibration equipment. Pressure calibration is a essential function within most industries where measurement instrumentation is used to monitor process performance and safety. Many companies are now approved and certified to quality standards such as the ISO9000. To maintain quality standards, there are numerous quality procedures, and because many industrial processes rely on the measurement of pressure, pressure calibration plays a major part in a companies quality assurance. High accuracy pressure sensors and instruments suitable for calibrating other pressure instrumentation such as pressure transducers, pressure transmitters and pressure gauges. Select a pressure reference standard or pressure calibrator here for metrology, laboratory, factory or field use. Calibration Hand Pumps- Pneumatic and hydraulic hand pumps for calibrating pressures or vacuums in conjunction with a pressure transfer standard. Digital test gages for fitting to the top of pneumatic or hydraulic calibration hand pumps to generate and measure precise pressures. Pneumatic calibration pumps for manually generating precise air pressure setpoints for calibrating pressure instruments with a precision pressure indicator. High pressure pneumatic & hydraulic pumps for generating calibration pressures with fittings for mounting a test gage or connecting to a pressure indicator. Low pressure test pumps for calibrating very low air pressures, with very sensitive adjustment of low pressure setpoints. 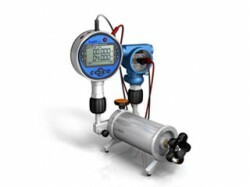 Pressure calibrators with in-built pressure controllers for automatically generating and setting calibration points. Pressure calibrators that include voltage and current measurement for displaying the output signal of the pressure transducer or transmitter under test along with the pressure reading. Calibrate submersible pressure probes used for measuring depth of liquids with these instruments. Articles with more detailed information on selecting and using pressure calibration equipment. Answers to questions asked about pressure calibration techniques and terminology. How is it possible to calibrate a pressure sensor with no zero or span adjustment, or a digital pressure gauge which can only be adjusted by the manufacturer? In the good old days, the accuracy was less stable than they are today for the majority of pressure instruments, and many included zero & span adjustment screws to allow technicians to regularly trim out the errors that would develop over time. Today, the sensing technology has advanced to improve long term measurement stability so much, that many devices will stay within the manufacturer’s original specifications for accuracy and will only need the occasional zero trim. Also the introduction of digital compensation techniques to improve accuracy over the operating pressure & temperature range, has increased the complexity of signal conditioning, with look-up data tables and algorithms being used to fine-tune accuracy performance. Due to this complexity, many manufacturers are blocking access to the calibration settings to prevent inadvertently upsetting the various parameters used to digitally compensate a pressure sensing device. So where before, one would carry out an “As Found” calibration check, then make some adjustments to zero & span settings, and then carry out an “As Left” calibration check, this is becoming a redundant calibration method, and is being replaced by a once only calibration check, often called “As Found”, to verify the accuracy performance is satisfactory. Often it is the case that the required accuracy is worse than the one stated on the manufacturer’s data sheet specification. So even if the device has deteriorated beyond the manufacturer’s specification, it may still be acceptable to continue use it. However, if the rate of accuracy deterioration increases between regular calibration checks, this would normally indicate it is time to replace. I have a pressure sensor installed on a system that cannot be accessed for the purpose of regular re-calibration, is there another way to ensure that the pressure sensor is still working within acceptable error tolerances? In applications where it is impossible to check the calibration of a pressure sensor over a long period of time, you have a few ways to ensure accuracy of the device. One solution is to to determine the required accuracy over the life of the installation and select a sensor where the long term uncertainty error has been tested or determined by accelerated life time testing. Another solution is to fit 2 or 3 sensors for the same measurement, since they are unlikely to change by the same amount over time. If one of the pressure sensors starts to output a different value to the other(s), then you can determine whether the change is significant enough to question the performance accuracy of that group of sensors. Extrapolating the possible error of the pressure service over the service life based on a short term test, or a theoretical estimate of accuracy performance based on manufacturer’s indicated values for long term stability are techniques often used to establish confidence in the performance of a particular pressure sensor type. However it is a much less reliable method since there is no way to test or monitor the assumptions made about the pressure sensor over time. How often should you calibrate pressure instrumentation? There is no recommended fixed period of time for re-calibrating pressure instruments since they all differ from each other in how accurately they measure pressure and how stable they are over time. Ideally if pressure measurement performance is critical to your business operation it is advisable to calibrate all pressure measuring devices as frequently as possible. Once at least 3 sets of calibration test results has been collected, the data can be compared to determine whether the re-calibration cycle can be lengthened. The stability of performance can vary quite a lot from one instrument to another due to the different kinds of sensing technology. The environmental conditions and frequency of use will also affect the performance. So it is very difficult to predict when and how much an instrument will drift out of calibration. The general rule of thumb is once per year for most instruments, if you are looking to comply with ISO9000. A label maybe placed on the instrument with a reminder date (normally 1 year). If the instrument is heavily used it might need to be re-calibrated more often, depending on the level of measurement accuracy required. When you send an instrument for re-calibration, it will be tested to see if it is still within the specified accuracy and the results will be recorded on the calibration certificate as “as found/received results”. If the calibration certificate includes before and after adjustment data then you can make a judgement on the re-calibration interval next time. If the calibration certificate only includes the before data, then the instrument did not require any adjustment. The amount of deviation compared to the last calibration will tell you whether you can lengthen or need to shorten the re-calibration interval. How accurate does a pressure calibrator need to be? This will depend on the required of the devices being calibrated. For example a process may only require a 1% accuracy for a pressure gauge which has an accuracy of 0.25% FS. So although the device is capable of achieving a 0.25% accuracy it only needs to be verified to be within 1%. Ideally you should try to aim for a 10 to 1 ratio between calibrator and device under test accuracy, but a lower ratio is often accepted, since many devices now offer much higher accuracies, making it more difficult to source a calibrator which is cost effective. Can a master pressure gauge scaled in psi be used to calibrate a process pressure gauge scaled in bar? Yes it can, first convert the pressure range of the master gauge to determine it’s equivalent value in bar, e.g. a 30 bar range is approximately 450 psi and would be suitable for calibrating process gauges up to that range. How low a range can be calibrated will depend on the difference in precision between the two instruments. When converting pressure units for calibration purposes make sure it is an accurate conversion so that no additional errors are introduced. How do you read the error of an analogue dial pressure gauge when the reading is between two dial marks? Apart from precision test gauges the dial marker (cardinal point) can be separated by a large gap without any graduation making it difficult to determine the exact reading. When calibrating these types of gauges it is best to set the required pressure using the device under test rather than the calibrator since it is easier to set the pressure to a cardinal point. The error can then be read more accurately from the calibrator where you will be able to read the pressure with much better resolution. e.g. A 30 bar gauge with 1 bar incremental marks is calibrated using a 30 bar calibrator with 0.1 bar incremental marks or resolution. To calibrate at the mid point of 15 bar, apply pressure to the gauge until the dial needle is lined up exactly with 15 bar cardinal point. Next note the pressure on the calibrator which might read something like 15.3 bar. If the calibration was performed the other way around you would have to approximate the 0.3 bar error since there is only a 1 bar reading resolution. Why do calibration procedures include increasing and decreasing points? Many pressure measuring instruments utilize a mechanical sensing device which relies on the deformation of a material when pressure is applied. When a material is flexed, it will change shape slightly differently when the stress is released and the material is allowed to return to its original shape. This effect is called mechanical hysteresis and is what causes the difference in readings between increasing and decreasing pressure points. When testing a pressure instrument the accuracy should be checked over both increasing and decreasing pressures to account for any hysteresis related errors. When considering hysteresis it is important to use a calibrator that has a much smaller hysteresis characteristic than the device under test. What does “traceable” or “traceability” mean in relation to pressure calibration? Most countries have a National Standards Laboratory which is tasked with providing and maintaining the countries most accurate measurement instruments which are the primary source of the countries measurement standards. In order to ensure all measurement devices are within the expected level of accuracy performance they must be regularly checked using a more accurate calibrator. The calibration is only truly valid if the calibrator accuracy has been verified. The validity of a calibrator’s accuracy is determined by the quality of it’s calibration, therefore a traceable calibration certificate should include some form of statement indicating that it can be traced back to national standards. If necessary it should be possible for a calibration certificate to provide enough information to enable a person to trace back the calibration of calibrators through the hierarchy of calibration equipment used by the manufacturer or service provider ultimately to the national standard. The actual cal cert does not have to include the complete trace back to the national standard, but it is expected that if a particular business was to be audited it should be able to prove traceability by producing calibration records. In the UK what is the difference between a traceable calibration and a UKAS calibration? A traceable calibration certificate may only include a statement such as “traceable to national standards” or the type and serial number of the calibration equipment. There is no way to verify this without auditing the company quality assurance system to validate the statement. Therefore without the benefit of a quality audit the authority of a traceable cal cert is based on the trust and reputation of the supplying company. To provide a more trusted calibration certificate, some companies choose to become UKAS (United Kingdom Accreditation Service) certified. This involves an assessment of the calibration equipment and staff to make sure they both meet a required standard and subsequent assessments are carried out to maintain accreditation. If a company is UKAS approved it is able to issue its own UKAS approved calibration certificates. What is the difference between a primary and secondary standard? A Primary Standard uses technology that measures pressure using fundamental parameters such as mass and area in the case of a Dead Weight Tester or a head of fluid (e.g. water, mercury) in the case of a Liquid Column Manometer. A Secondary Standard is one that measures pressure indirectly via a gauge or sensor and should be calibrated on a regular basis using a more accurate secondary or primary standard. What is the validity of a calibration certificate? A calibration certificates does not have a period of validity, since they are a record of measurement performance on the day tested and do not include any time period. A manufacturer may indicate stability performance over a period of time or recommend a re-calibration period as a guideline. I expect digital precision pressure test gauges used for calibration purposes will eventually go out of calibration after frequent use. How often do you recommend to re-calibrate? The larger the ratio the better, between the accuracy of calibration equipment and the device under test. A ratio of 10 to 1 is becoming difficult to achieve as improvements in technology have narrowed the gap in accuracy between pressure calibration equipment and measurement devices. It is possible to use any ratio, even 1:1, as long as you factor into the uncertainty, both the calibrator and the unit under test into the overall accuracy constraint. If the long term stability of the calibration equipment is around 0.1% per year, and the accuracy is 0.05%FS. If you needed your equipment to be accurate to say 0.5% full scale, an annual re-calibration should be adequate for the calibration equipment to maintain ~ 3:1 ratio between the accuracy of the calibration standard and the pressure measurement equipment requiring calibration. Once you have gathered this information together you will be able to determine an acceptable re-calibration period for the pressure calibration equipment. As a general rule combining all the errors to determine the total uncertainty will provide the worst case error. In reality the overall error will be smaller due to cancelling of opposing errors, and the root sum square (RSS) mathematical method can be used to produce more realistic numbers. I have been asked what sensor orientation should be used when calibrating a high accuracy pressure transducer. This is the first time I’ve been asked about orientation, why this is so important for this sensor? All pressure sensor diaphragms will bend to varying degrees due to the gravitational weight of the diaphragm material and the weight of any fill fluid that might be present to protect the sensing element behind the diaphragm. This gravitational effect is more prominent with low pressure ranges which have thinner, larger diameter diaphragms, and with very high accuracy devices where the affect on performance is more noticeable. If you hold the sensor so that the plane of the diaphragm is horizontal this will generate the most negative calibration offset. If you then flip the sensor upside down you will generate the most extreme positive calibration offset. Therefore to ensure that the calibration results gathered in the lab correlate with the performance of the sensor when installed, it is necessary in some cases to duplicate the installed mounting orientation during calibration. I have an absolute pressure transducer and need to check the output at zero pressure, how is the device checked when manufactured? Most manufacturers will not calibrate at zero absolute pressure because it is difficult and time consuming to achieve a very high vacuum. To get round this problem, a zero point calibration is normally performed at a few millibar absolute and is extrapolated from all the calibration points using the best straight line method. Why do Pressure Calibration Certificates show Rising and Falling Results? When looking at a calibration certificate you will notice that the calibration points are set out in the order they were recorded as one set of rising results followed by a set of falling results. The majority of pressure measurement equipment relies on the flexing of a mechanical component such as a metal diaphragm or a Bourdon Tube to sense a change in pressure. If you compare increasing pressure points to decreasing pressure points you will discover that the readings do not match exactly. This is due to Mechanical Hysteresis and the amount of error will vary depending on the amplitude of the cycle of pressure. If each pressure calibration point is applied in an increasing or a decreasing sequence, the Hysteresis can be eliminated from the results leaving only the Linearity errors to be checked. The Hysteresis can then be checked independently of linearity by comparing the rising and falling calibration data collected over a full range cycle of pressure. If the calibration points are set randomly, there will be no way to separate Linearity and Hysteresis errors and therefore it will not be possible to quantify the contribution by each to the overall error. My process pressure transmitter reads 12.5 bar but a pressure gauge in the same line measures 11 bar, what might be the problem? Have both instruments been calibrated recently? If not we would suggest each device is disconnected from the system and compared to a traceable pressure & current measurement standard. If they are both reading correctly, then the problem is probably with the instrumentation connected to the pressure transmitter, which should be calibrated together with the pressure transmitter. Send us your enquiry for a product associated with this Pressure Calibration page, and get assistance with selecting a product for your application.